So much to live for. From cervical cancer warrior and runner Tammy Watson. Every day at RMA I am honoured to be surrounded by amazing resilient women. 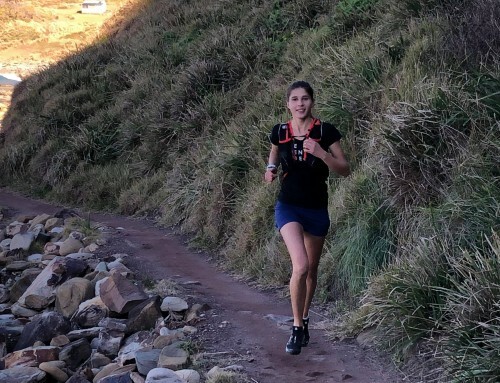 Women who share their stories of hope and triumph over adversity, and using running as their vehicle to fulfilling their dreams and connecting with others. Some times I come across a story that just speaks right to my soul. I have been following Tammy’s journey for a while, and I knew there would be the right moment for her to share this with the wider RMA community. This is that time. Tammy shows us what a positive mindset and support of others can do to a life. That when faced with the fear of a diagnosis, that you can turn that right around and stare it right in the face and say, no. I am going to live free of that fear and live anyway. In the midst of dark times, her spirit shines through and shows others that giving up is not an option and that being surrounded is so important. This is her story. As I sit here in yet another hospital bed, I can’t help but reflect on what has been some of the toughest but also enjoyable times in my life. 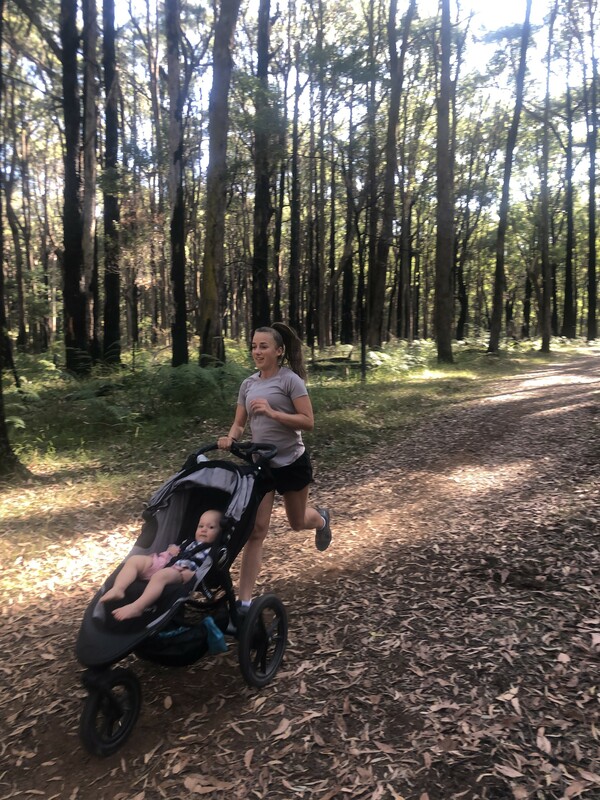 When I was asked by Nicole to write a piece about my running and cancer journey, I could not help but feel completely honoured, but I also wondered to myself why and where would I start? 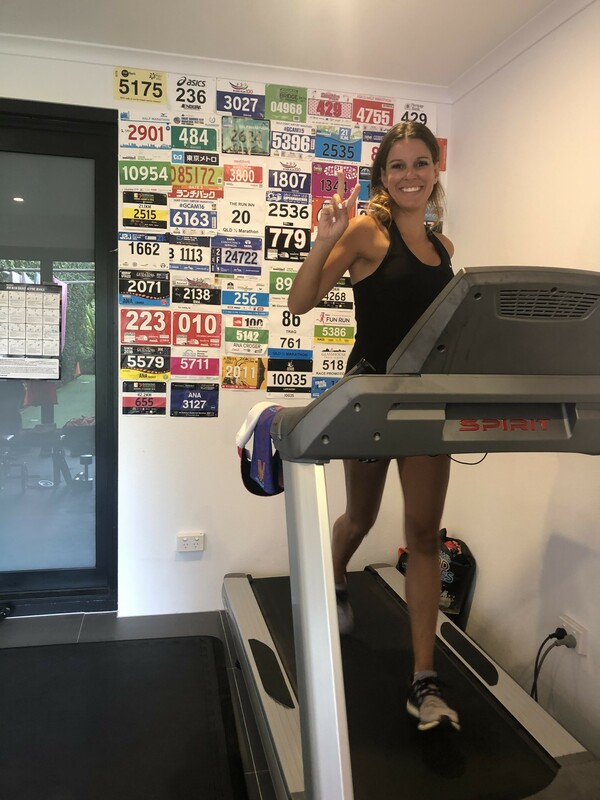 My diagnosis of cervical cancer came not long after Gold Coast Marathon 2017, in fact I had a procedure relating to my diagnosis only a couple days before I ran the 10km. My treatment started on 1 August 2017 with what was going to be probably the worst 6 weeks of my life. Daily radiation and weekly chemotherapy saw me extremely sick including two weeks in hospital, losing weight and just an absolute mess. During this time, I would open Facebook and read all these cool running posts on the RMA page, which mind you I was only introduced to about a month prior to my diagnosis. I remember feeling so horrible when reading a post by our one and only Wendy Vickery. I literally laughed out loud. I don’t think I had smiled like that since the treatment started. It took me a while but I finally built up the courage and I sent her a message thanking her for her awesome funny posts and realised it was really helping me get through those down in the dumps days. By the time I had finished this part of my treatment I had decided I wasn’t going to let cancer define me or beat me anymore. I was going to make sure I made the most of what I had to come. I had about 10 days between this part of my treatment and the next phase which was internal radiation (let’s not go there). So, I put my big girl pants on and started doing a few slow runs. I was determined to get my strength back. Brachytherapy was not easy, but was only a few days out of my life. Post brachytherapy I was offered more chemotherapy to ensure I had the best chance of beating this cancer. It was at this point I realised that part of this was a mental game. If I could will myself to be better, to feel better when I felt like crap, if I could make myself accountable, have some fun and make the most of what I have, it would make getting through the next three months bearable. With this new outlook, I decided to set myself a promise. I would attend parkrun every Saturday, rain, hail or shine, no matter how gross, horrible, sick or well I felt and I would participate each week during the last part of my treatment. So I did, I guess the funny part was I set out this plan and then on my first week of chemo, I had a severe allergic reaction to one of the chemo drugs. I had this harrowing experience where I couldn’t breathe, had the whole works and jerks as far as medical team making sure they kept me alive. That week we just happened to be going to the Sunshine Coast and I had already made my commitment. I have to admit I was pretty excited to find out that Mandy Oliver was going to be in the same area and she was agreeable (despite being on a weekend away with hubby) to coming with me. Still exhausted from my experience a few days before, I ran my little heart out with Mandy (thankfully she recorded it as I didn’t). This was the start of this amazing journey with RMA. Each week I either volunteered or walked or jogged parkrun, I attended a few different locations and met some of the most amazing people. Many of these women I now call friends. So many of you put your hand up to walk with me, dance with me, dress up with me, do crazy stuff with me and just be there for me. From Paradise Point to Kirra to Redcliffe, each parkrun I attended I was never alone. As the weeks rolled on and my chemo affects became worse, I had days where I did not want to get out of bed, but I was being held accountable, I got myself out every week and had a great time. The neuropathy was kicking in, the exhaustion was evident but I felt I had something else to live for. In typical Tammy fashion I had to enter an event during the middle of all of this (actually this was the 2ndevent, I had completed a SEQ trail event in November). The GC50 race was being held in December. Yes, hot and sticky December. I decided to enter the 15km event. Not having run this far before let alone since starting treatment. Actually I hadn’t run past 5km since commencing treatment. But hey, you only live once. 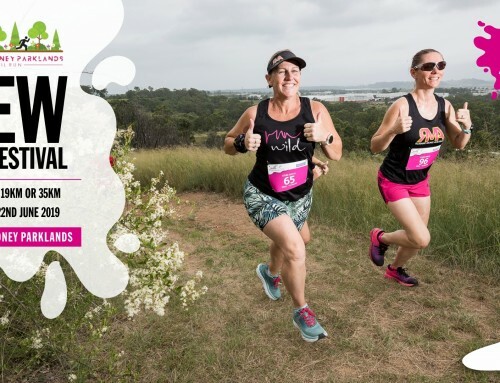 I had managed to convince my dear mother to enter the 5km event, so at silly o’clock we rocked up to Broadbeach and had a wow of a time getting photos and hanging out with the RMA tribe. Mum completed her first ever “fun run” and I completed 15km whilst feeling sick and horrible. I still don’t know what I was thinking, but I did get an awesome jump shot. It is funny looking back as during all of this cancer stuff we found out about our two youngest children having a rare eye condition, and both going blind. The running community really showed it’s true colours at this festival. Mandy had organised with “The wounded pelicans”, Tofe and Antony to deliver some toys to my beautiful little people at the finish line. These guys ran 50km in santa suits and then crossed the line with sacks full of goodies for my babies. This moment will live with me forever, the whole event got behind us and we were able to get on stage and tell people what was going on for us. As Christmas drew closer and the end of my treatment too was coming to an end, my final chemotherapy was finally going to take place on 3 January, which would mean I would complete my parkrun promise on 6 January. One person that had put her hand up months before to walk with me at an RMA catch up was Sally Kingston, she has been a constant face of support (amongst many others), she jumped at the opportunity to make sure my final parkrun promise and celebration of finishing chemo was something ever so special. Deciding on a teal theme (cervical cancer colour) Sally managed to rally the most amazing crowd to attend Coomera parkrun to celebrate with me. Not only this, but women all over Australia wore teal to their parkrun or their run, to celebrate with me. It was so hard for me to understand why all these women were there to support me, little old me. I couldn’t work it out what did I do, to deserve this. This unconditional support from in many cases people I actually didn’t know. Now after all this treatment, one has to wait a few months to get some scans and hope for the all clear. At five months post radiation, I had my first lot of scans, it was not all good news. Yes my cancer had reduced in size, but there was still some there. I was heartbroken, what now? Long story short, I needed a hysterectomy, not exactly what I thought was going to happen but it is what it is. So with this in mind, I knew I had to build up my fitness and strength to give myself the best fighting chance. Of course I start building up my kms and what better way then to challenge oneself is to enter yet another event with zero training. Yup welcome to Up The Buff!! By now those of you who have followed any part of my journey, know I am crazy, but who wakes up one morning, with no training and decides to do a 16km trail run… Yup me. I have been determined not to let cancer win! I am glad I waited until now to write this, as again I couldn’t help but be completely overwhelmed by the RMA community. The night before I came to hospital, I had a bit of a giggle to myself. During chemo I had been wearing my RMA top to my chemo sessions, I did this to support a fellow rumma battling breast cancer. I just knew I would wear my RMA top to hospital, so why not do hospital flat me. This was my race, I have been determined to win and so this was it, I had to show cancer I was going to win. So up went my flat me to RMA. WOW is an understatement. I still can’t get over the hundreds of comments and likes to my post. All the support just blew me away. So, as I lay here in what I hope to be my last trip to hospital in a very long time, I smile because I have finally won. My cancer has gone, it has been a tough 9 months, but I don’t think I would have made it this far without the support of the RMA community.